An all-electric BYD ebus is now carrying passengers in the Polish Capital. MZA Warsaw, the municipal transport company, is testing the environmentally friendly bus from the Chinese auto giant BYD until June 18, 2013. The bus is working on route 222, which runs through some of the main streets of Warsaw, such as Trakt Królewski. The BYD ebus can drive for 250 km even in heavy city traffic after one full charge. This is the furthest range of any electric bus. Charging time depends on the applied charger. The bus that is tested charges in the depot in just 5 hours from a completed depleted battery. Pure electric BYD buses have been used in public transport since 2011. In China already 1,000 such buses have been built In the city of Shenzhen, 200 BYD electric buses have together accumulated almost 17 million km in passenger carrying service. In the first quarter of 2013 the BYD ebus obtained full European certification. This allowed the company to start selling buses on the European market. The Dutch province of Friesland is the first place in Europe where BYD electric buses are in use. The ebus built by BYD, is the first pure-electric bus powered by Iron-Phosphate battery in the world. More than 250 BYD ebuses are now in passenger carrying operations - by far the largest number from any bus brand. BYD ebus measures 12 meters long and is designed for customer transport comfort in mind. The technically advanced and specially designed wheel-hub motor, and its electronically controlled air suspension can offer customers a product with an exceptionally low floor, multiple door choices, and ample floor space for easy passenger access. The imposing windscreen occupies two thirds of the frontal area of the bus for maximum viewing as well as safety. The bus body conveys an elegant exterior image, while the interior boasts an air of quality with adjustable driver’s seat, durable seats for passengers and a carefully engineered sound insulation keeping the interior ride whisper quiet. 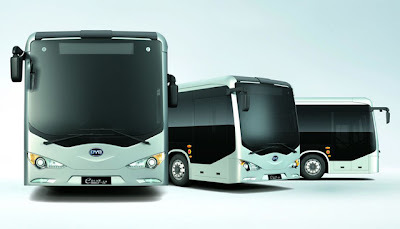 BYD’s pure electric bus employs many advanced technologies developed in-house by BYD’s 15,000 engineers strong R&D team. For example, the Iron-Phosphate battery or “Fe Battery” used on the BYD ebus is safe and non-polluting: the materials contained in the battery can be recycled or safely disposed of. Orders have been awarded in China, the Netherlands, Finland, Denmark, Uruguay, Canada and the United States. The BYD electric bus has also been successfully tested in many cities in Europe including Madrid, Barcelona, Budapest, Salzburg, and etc. The accumulated mileage of the 200 electric buses operating in the city of Shenzhen(China) alone have exceeded 15 million kilometers (or 9.3 million miles) by the end of March 2013.